Happy 100 editions! Here's to 100 more! Coming of age with 21 years of publishing and reaching the 100th edition of Countryside La Vie is no mean feat, especially as the world continues to change, the country has seen both boom and bust and technology has changed the way we live our lives right down to how we receive our news – so it makes me smile to know the good people of Leicestershire still enjoy to sit down with a nice cup of tea to flick through Countryside La Vie. Being part of a farming family with well over 100 years experience, we have seen many changes and know we will continue to do so. The technology we have on farms today baffles Dad, so just imagine how it compares to The Mounts that were farming at the beginning of the 19th Century? Only eating fruit and vegetables that were in season, ploughing by hand, using actual horse-power not souped up engines containing horse power. Recently we have been planting the brussels and although there are many new-fangled machines we could use we have an old plug planter where four people sit on the back and drop the brussel plants into moving wheels for them to be planted. The machinery is older than Dad and can still be fixed with a spanner rather than a computer, Mum and Fliss are roped in to take part and when you look back at that field having had the breeze on your face and fresh air in your lungs you just can’t beat the feeling of fulfilment and satisfaction. Having said all that if the weather remains as fabulous as it has been I will be very glad of the air conditioning in the combine – but still won’t listen to the radio so that I can hear the ground and any potential pitfalls – this is one step on from Dad who is happy to corn cart but has no intention of driving a machine with screens!! 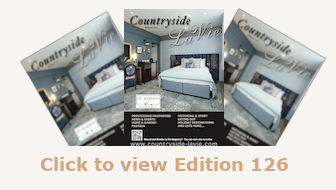 for Countryside La Vie – all of which have been an added extra pleasure. 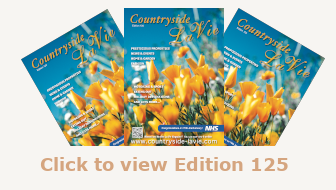 To celebrate your 100 editions we have added some colour to our shop front and re-introduced ‘The Potting Shed’ so everyone can celebrate summers arrival with a bit of colour in their lives – we have come to the conclusion at Roots that if you have a garden and a copy of Countryside La Vie – you have all you need. Palm Oil - At what Price?